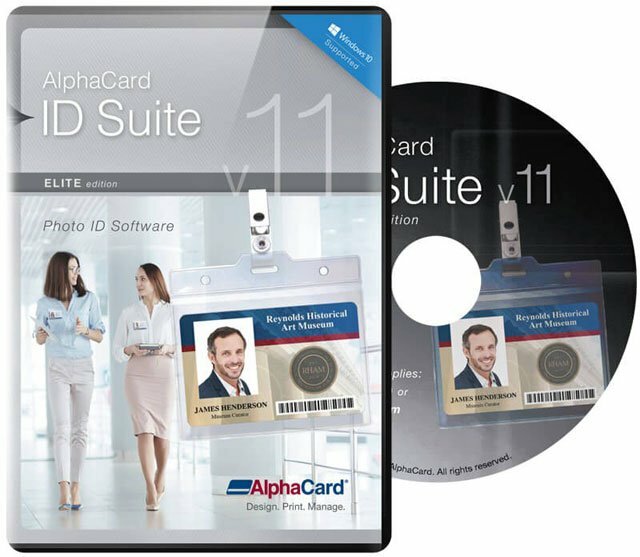 AlphaCard ID Suite Elite card design software is the most advanced version, providing you with the card design, encoding, and database options you need to print cards and store cardholder data. If you need to protect secure or sensitive data, Elite allows for file password protection and the creation of authorized user accounts. It's easy to include all your important information with AlphaCard ID Suite Elite "" the software is compatible with Logitech digital cameras so you can easily pull in cardholder photos, along with your business logo or other images, and text fields for your cardholder"s information. You can also use Standard to code and print 1D and 2D barcodes, including QR codes, along with HiCo and LoCo barcodes. You"ll also have advanced encoding options with AlphaCard ID Suite Elite. With the Elite edition, you have the most options for incorporating an external database. Choose from Access, Excel, CSV, MS SQL, MySQL, or Oracle database, or use the built-in unlimited database "" or use more than one, as Elite allows multiple databases to connect. Elite also offers support for IronPython scripting. ID Suite Elite Edition, Single User which includes AlphaCare Support. 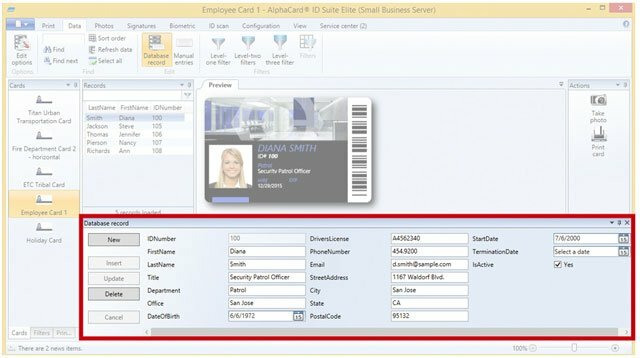 The AlphaCard ID Suite Elite v11 is top-of-the-line ID card software solution for large-scale organizations and business operating across multiple sites. 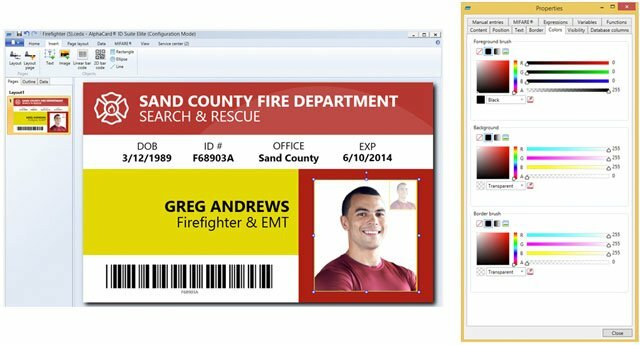 Provides users with the tools they need to produce professional and secure ID cards. A solution for centralized data management and provides sophisticated features such as advanced field formatting, ODBC/OLE DB connectivity, password protection, user authorization, digital key encryption and watermarks. Can integrate with digital ID cameras, scanners, signature pads and other external devices. Has versatile tools including custom drop down lists, batch record updates, and the ability to import records from external databases or scanned ID cards, including driver�s licenses. Compatible with all PVC card printers. Not currently supported on Tablets or Surfaces. Please call with questions regarding compatibility with any hardware platforms not mentioned. AlphaCare is the industry's best support plan, and it's FREE with the purchase AlphaCard ID Suite software. This exclusive benefit includes direct access to our professionally trained technical support experts who have years of experience in the industry. 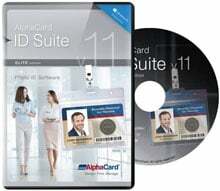 AlphaCare requires the purchase of AlphaCard ID Suite Software. AlphaCare (with the purchase of a printer and software) includes Free 1 hour Setup Assistance & Training within the first 30 days, Return Protection & System Upgrade Program, and 30 day "Quick Call" Troubleshooting by Phone & Email. AlphaCare (with the purchase of AlphaCard ID Suite Software only) includes Free 30 minutes Setup Assistance & Training within the first 30 days. Additional assistance & training can be purchased for $150 per hour. With AlphaCarePlus, you get all the benefits of AlphaCare and more. AlphaCarePlus entitles you to unlimited Phone supprt throughout the year, VIP Phone & Email Queue for quick support, Free Software Updates, Annual Printer Check-up, and Advanced Configuration Help. Service is renewable annually. AlphaCarePlus is eligible on any printer or AlphaCard software purchased.